Copyright © 1997-2011 by Michael I. Holmes. All rights reserved, not for reproduction. These are my personal collection of banjo wrenches plus a couple lent to me, the result of 30 years of rummaging in banjo cases. I have seen a few others, and Akira Tsumura's book, 1001 Banjos, has several more. 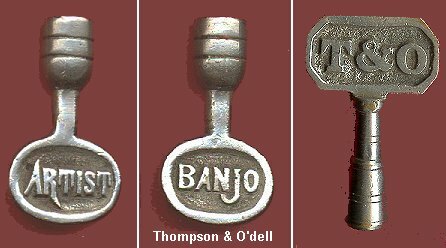 I am interested in purchasing any banjo wrenches with names or initials on them that I don't already own or fancy no-names. Information about the US Makers is taken from my forthcoming book "The Encyclopedia Of American Musical Instrument Makers." Information about the British Makers comes primarily from a series of articles published in the 1950s in a magazine titled BMG. Bacon. Frederick J. Bacon was a famous banjo player. In 1922 he was joined by David L. Day in the Bacon Banjo Company at Groton, CT. where they produced the B & D Silver Bell banjos which were very successful. 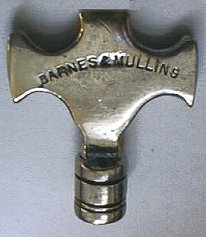 Barnes & Mullins were British wholesalers of musical merchandise. Circa 1894 they started a magazine called "The 'Jo" and began offering banjos under their own name but built for them by the major manufacturers. 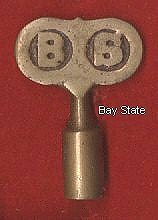 Bay State, brand name used by John C. Haynes Co, Boston, MA for their better grades of guitars, banjos and mandolins from circa 1861. Wilson Bohannan Brooklyn, NY. Not a banjo wrench, but it looks like one. 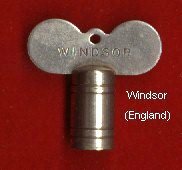 The socket is 5/16ths square & fits Civil War era banjos perfectly, but it was used for unlocking water valves circa 1920. Click to visit website. J.E. (John Edward) Brewster was a banjo teacher, player and author of several tutors. c1872 he joined John E. Dallas. In 1896 he was granted a patent, but banjos with his name were actually made for him by Dallas. James H. Buckbee (JHB) Earliest mass producer of banjos from shortly after the Civil War (before and during which he made drums) until late 1890s. The vast majority of Buckbee banjos have names of others -- teachers, performers, shopowners -- for whom he built and labeled instruments but many have no markings at all. A few have his initials JHB on the side of the heel. 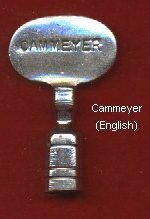 Alfred D. Cammeyer, invented the "zither banjo" in the US circa 1880s which he seems not to have patented, but moved to England in 1889, where he and his style of banjo had the greatest success. Cole's Eclipse. W.A. Cole active c1880-1908. Joined with A.C. Fairbanks 1880-1890, later as W.A. Cole until his death c1909. Succeeded by younger bother, F.E. Cole. The Eclipse models are their finest instruments. Dayton String Instrument Company was founded at Dayton, OH in 1911, changed the name to Dayton Banjo Company in 1920. In 1922 moved to Sioux City, IA and were still in business in 1932. 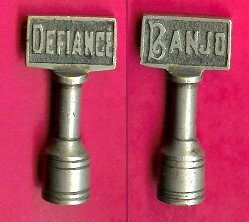 Defiance, Joe Daniels, a British performer and teacher, advertised as a "Musical Instrument Maker" circa 1870. In 1887 he was issued his first patent which was for a tailpiece, and later he patented his "Defiance" banjo. Oliver Ditson, major Boston manufacturer, retailer and distributor 1834-1940s with branches nationally. Also had a hand in founding Lyon & Healy, John Church, and John C. Haynes . Henry C. Dobson & Sons. NYC performer and teacher 1851-1903. Patented a closed-back banjo in 1867, which he licensed to the Martin Brothers (not C.F. Martin). Most of Dobson's later banjos were made by Buckbee. A.C. Fairbanks was the premier banjo maker in Boston from 1870 (alone and with W.A. Cole). The Electric model was introduced c1890. Fairbanks, destroyed by fire in 1904 was sold to Vega, a guitar & mandolin manufacturer. 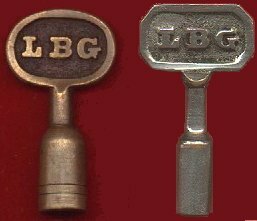 Lincoln B. Gatcomb, for a while the leading Boston, MA banjo and guitar maker, in business 1875-1895, he made Robinson banjos circa 1891, and the Lansing Banjo. Gibson, 3 variations. Gibson was late entering the banjo scene circa 1918, but their Mastertone models from 1925 on are sought after by players and collectors, alike. Gretsch, respected maker of instruments in Brooklyn, NY since 1883, they manufactured drums, banjos, mandolins and guitars over the years. 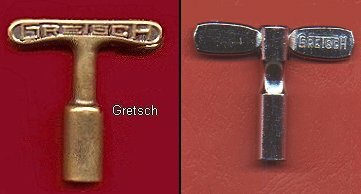 Brands used by Gretsch include Daynor, Rex, Clarophone and Orchestrella, among others. Gretsch acquired the Bacon name in the 40s and produced banjos into the 60s. Gretsch was sold to Baldwin in 1967. 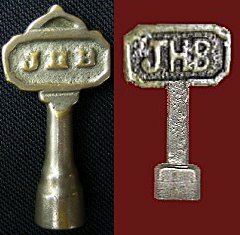 The wrench on the left is from the 'teens or 20s. The other from the 1950s. John Grey banjos were made by Rose, Morris & Co. Ltd, a British Company. 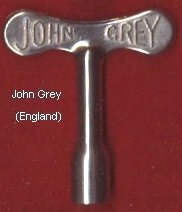 Although the history of the company goes back to 1830, the modern incarnation that made instruments under the John Grey name is c.1960 - 1967. 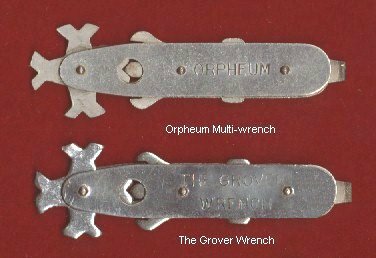 Grover Multi-wrench - Founded c.1894 in NYC, Grover was the other company (along with Waverly and Elton) responsible for the bulk of musical instrument accessories. None of the three made instruments, just parts. 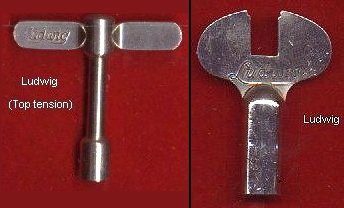 Leedy, the wrench on the left has a small bar across the opening to engage the slotted nuts unique to Leedy banjos. 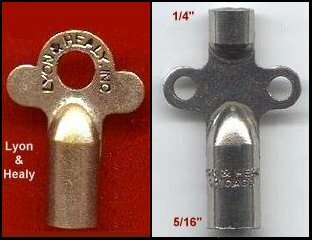 The one on the right is a recent discovery, used with conventional banjo hardware. Founded 1898 to make drums, Leedy built a line of tenor banjos from 1926 until they merged with Conn in 1930. Ludwig & Ludwig, manufacturer of drums from 1909, made an unsuccessful attempt 1921-1929 to market a line of banjos. Ludwig merged with Conn in 1929. They had lost a great deal of money on the banjo venture and vowed to stick to drums for the future. The upper wrench is for their Top Tension model. The slot in the handle of the lower wrench fits over the top of their Planet pegs to adjust the spanner nut. The edge is thinned to use as a screwdriver. John F. Luscomb, Boston, MA, c1893-1928. He may have actually made a few of the fancy, custom instruments but most banjos with his name were made by Thompson & Odell. Lyon & Healy, established in 1864 by Oliver Ditson and later sold to the two founders, George Washburn Lyon and Patrick J. Healy, whose pioneering use of advertising was responsible for much of their success. James Morrison, NYC, made banjos under other people's names as well as his own circa 1870-1912. 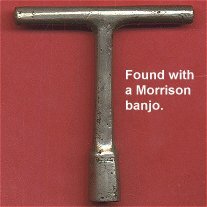 This wrench was found with one of his banjos, but may not be "original issue." 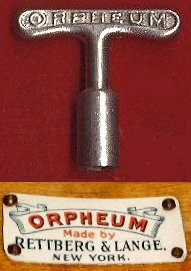 Orpheum Brand name used by Rettberg & Lange from circa 1903 to the 30s on a line of high grade banjos. 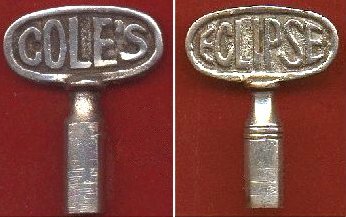 The name was later acquired by other companies, but the wrenches come from the earlier period. 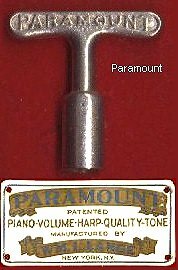 Paramount was the most successful of the Wm L. Lange (formerly Rettberg & Lange) banjo ventures -- produced in the 20s and 30s. Circa 1942, the stock was sold to Gretsch. 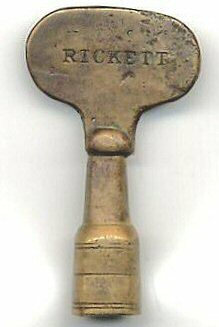 Joseph Rickett, Philadelphia banjo maker and performer, circa 1880s, credited by Armstrong with developing the first successful fretted banjo. Skinner Charles Skinner, London, England teacher & dealer, claimed to be a maker from c1890, but all the instruments he sold with his name were made and labeled for him by Temlett and later Abbott. 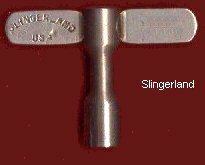 Slingerland Banjo & Drum Co, Established in 1916 at Chicago, IL. They marketed a line of banjos, among them the "Maybell" circa 1918-1929. 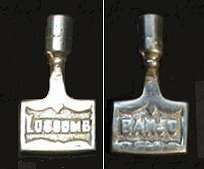 After 1944 they dropped the word "banjo" from the company name. 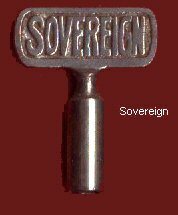 Sovereign, Oscar Schmidt brand until 1935 when the name was sold. Best known for the Autoharp, they were the largest of the student and amateur grade instrument makers, with 7 factories in the US and Europe. 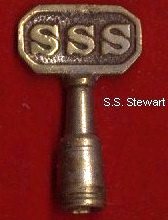 S.S. Stewart Philadelphia, PA performer, teacher and writer, he became the first of the commercially successful and one of the most important of the banjo manufacturers , 1878 until his eath in 1898. William Temlett, prominent British banjo maker from circa 1846 producing primarily zither banjos under the names of many famous retail outlets. He suffered a debillitating stroke in 1900 and died 4 years later. Thompson & O'dell. Boston instrument manufacturers and music dealers 1872-1905, I.H. Odell and C.W. Thompson. They used the Artist and Crescent brand names. The one on the right recently surfaced and has the T&O logo on both sides. 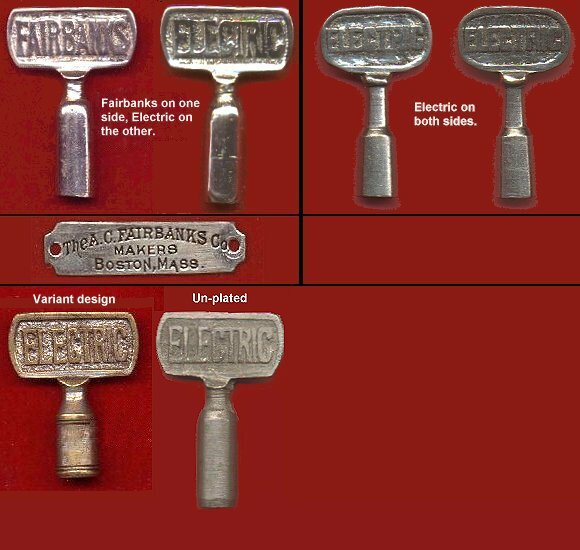 Vega, purchased Fairbanks in 1904, and having no reputation in the banjo field, marked them Fairbanks until c1909, after which stamped "Fairbanks by Vega" until c1922 when they dropped the Fairbanks name altogether. 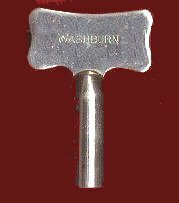 Washburn was a Lyon & Healy brand for their better instruments. The name was taken from Lyon's first and middle names. There was no maker named "George Washburn." Waverly Music Products, NYC, the major metal parts manufacturer for virtually all the East coast banjo makers, from before the turn of the century until the 1970s when the company was bought by Stewart-MacDonald. Weymann & Son (W&S). Attached is an ad from 1892 showing the W&S logo. In business from 1864 to the 1940s, it is the banjos made in the 20s & 30s for which they are best known. See also "W" below. 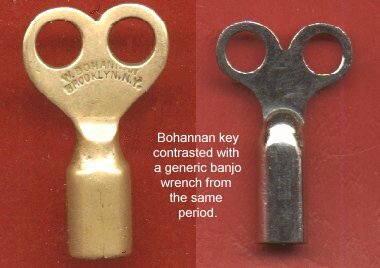 The wrench was with a 20s-30s Weymann, bought from the original owner, in its original case, all original & complete parts. I believe that it is Weymann key. See also "W&S" above. Windsor Arthur Octavius Windsor began making banjos c1888 and with various partners & company names built, what was at the time of its destruction in 1940 in an air raid, the largest fretted instrument company in England. 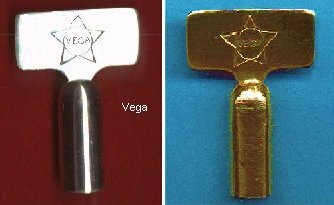 No name - wrenches like these fancy ones were advertised in the 1880s by Weymann, Pollman, & others for both square and hex nuts. 1-3, variations on a theme, 1 & 5 are for square nuts, the rest hex. Some are British. Attention Webmasters: You are welcome to link to this article from your website, crediting the source, but you may not copy it and post it at your site. Thank you for your cooperation.